Horses For Courses is the report that is available to all registered users on a Friday, and it shows what a decent record Ambitious Icarus has on the all weather track at Newcastle. He has raced here ten times, winning four of them (40%) and being placed in six of them (60%) for level stakes profits of 18.00 and 24.50 respectively. Ambitious Icarus has been running consistently recently, with a win and four places efforts in his last six races. He is just the three pounds heavier than his last victory which was here at Newcastle and he ran well in third place over course and distance last time out. When expanding the trainer form when looking at the racecard tab we can see that Richard Guest has quite a reasonable record here at Newcastle over the last year. He also has an excellent record with runners come out again within seven days of their previous run. With such runners he's had 22 winners (14.38%) and 53 places (34.64%) for level stakes profits of 31.75 and 20.79 respectively. 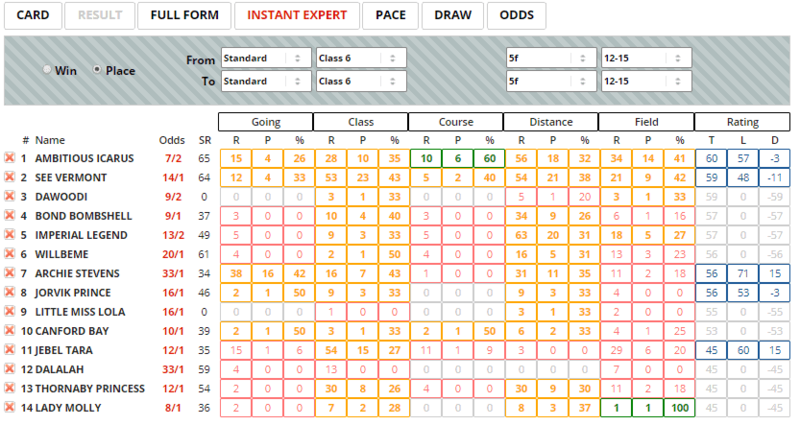 There are just the two sections of green on the Instant Expert report on the 'Place' setting, and one of those belongs to Ambitious Icarus for his course record. He also has four sections of amber which shows he is reasonably well suited to today's conditions and I am hopeful of a good run. When looking at the Pace tab we can see that there isn't a huge bias when it comes to running styles here over this distance. Prominent runners have the best record just ahead of leaders, but even horses that are held up are not too far behind these in percentage terms. Ambitious Icarus is usually held up and therefore may require a little bit if luck in-running if he is to avoid trouble and come home in front. 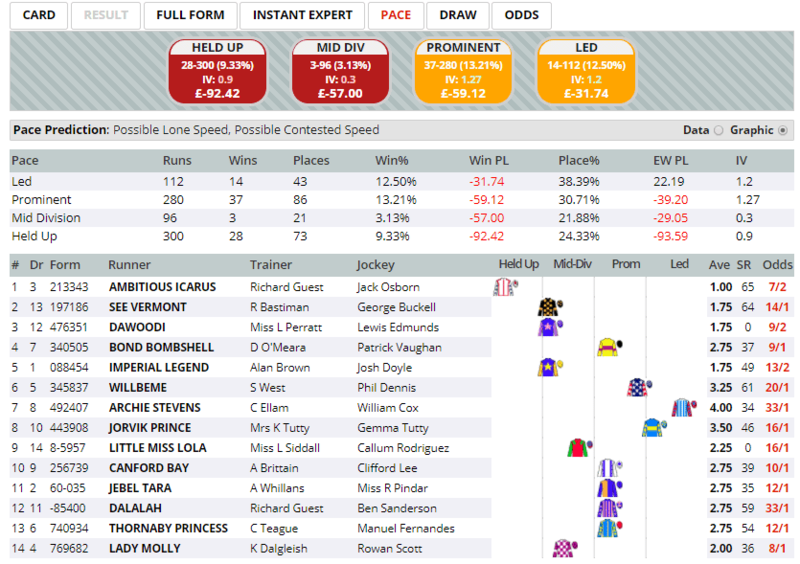 Click here for the 2:15 at Newcastle.